NATIONAL CHAMPION. In very good health. The surrounding area was originally cleared for dairy farming and a house did exist nearby but has since been demolished. 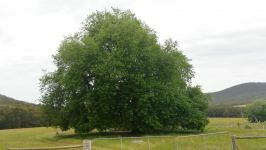 The tree has good structure but has some crossing of large limbs. Not too many Oaks like this in Victoria; it�s a real beauty.